Transparency Market Research (TMR) recently published a market research report that elucidates the vendor landscape of the global market for wireless charging ICS. Witnessing the huge market potential, several new players have entered the global market for wireless charging ICs over the past decade. It is expected that the entry of new players into the global market will prompt a counter response from the existing players. This response could take the shape of better and more innovative strategies, introduction new product lines, or expansion of geographical reach. Although the current competitive landscape of the global wireless charging IC market is largely consolidated, it is expected to undergo progressive fragmentation over the forthcoming years. The current market players in the global wireless charging IC market have been making coordinated efforts to strengthen their position in the market. On the other hand, the new entrants in the global market for wireless charging IC are projected to form strategic alliances in order to strengthen their position in the market. The global market for wireless charging IC is expected to grow at a boisterous CAGR of 24.54% over the period between 2016 and 2024, according to a report by Transparency Market Research (TMR). The global market was valued at US$1.43 bn in 2015, and is expected to touch a stellar value of US$10.14 bn by 2024-end. Asia Pacific has emerged as the leading regional segment of the global wireless charging IC market while receiver ICs have outdone the transmitter ICs in terms of demand. In the contemporary times, portable consumer electronics have become an important part of the lives of people. This is expected to propel demand within the global market for wireless charging IC in the cotemporary times. 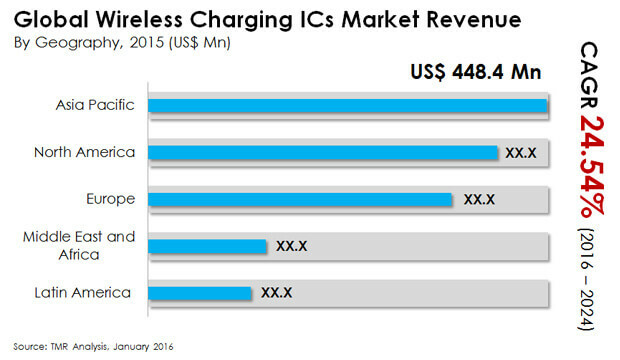 Furthermore, travel for several business-related and leisure purposes have also led to an increased demand for wireless charging ICs. It is expected that the growth of the consumer electronics segment will give a push to the growth of the global market for wireless charging IC. Smart watches and smart phones witnessed unprecedented levels of demand in recent times. People from all classes and backgrounds are necessarily using these electronics for their daily recourse. This is expected to give a push to the demand for wireless charging ICs in the forthcoming years. Despite the growing popularity of wireless charging ICs, the demand within the market is restrained by the glutting of markets with duplicate products. This has taken away the trust of the consumer and has created apprehensions in their minds about the possibility of falling into the trap of unethical market practices. However, the commendable popularity of wireless charging ICs coupled with the efforts of the market players to produce quality products is expected to soar market demand in the years to come. The review is based on TMR’s report titled “Wireless Charging ICs Market (Type - Transmitter ICs and Receiver ICs; Component - Relays and Circuit Breakers; Power Solution - Low, Medium, and High; Application - Smartphones and Tablets, Wearable Electronic Devices, Medical Devices, and Automobile Products) - Global Industry Analysis Size Share Growth Trends and Forecast 2016 – 2024”.